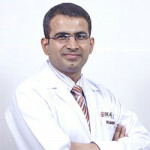 Dr. Manav is a Senior Consultant Gastroenterology. His area of expertise lies in Hepatology, Liver Transplantation, and Therapeutic ERCP. Dr. Manav Wadhawan has been trained in Transplant Hepatology at Montreal, Canada in 2005. In 10 years of his professional career, Dr. Wadhawan has worked in AIIMS, G B Pant Hospital, Sir Ganga Ram Hospital and Indraprastha Apollo Hospital. He played an instrumental role in setting up transplant program at Indraprastha Apollo Hospital. Dr. Manav Wadhawan has been honored with Young Investigator Award by International Liver Transplant Society in 2013. Presently working as a Director in Institute for Digestive & Liver Diseases at BLK Super Speciality Hospital, New Delhi.